The Institute of Fiscal Studies reports every school will have cuts, as a result of the National Funding Formula currently being proposed. The Department of Education reports a £3 billion overspend which is carried over to the new budgets. For the last 2 years the National Audit Office reported to Parliament that they cannot approve the accounts of the Department for Education. Academy schools are facing the same CUTS from successive years and CUTS from the proposed National Funding Formula still to come. A Kent grammar, also in the national media is turning to parents to “fund the gap”. Parental charges for essential resources such as Teachers and text books is proposed as school fees for parents to pay. Teacher redundancies equal larger class sizes. Teaching assistant redundancies undermine quality education. Cuts to teaching and Teaching Assistant jobs at a time when there is a crisis in teacher recruitment and retention is foolhardy to say the least. Government can find money if it wants to fund the future of our children ’s education and the future of the teaching profession. Government has allowed huge, unacceptable waste of the education budget for example 17 free schools have been funded lavishly and closed in the last 4 years. There should be public information listing the land the DfE and Education Funding Agency has purchased for free schools out of our education budget but there is not. It is not at all clear who is holding the title deeds to all this land purchased and the land that left public ownership through academisation. The reasons for the waste of money including the legal costs of academisation are not in any way connected to improving education and are ideological. Barnet has 90 local authority primary schools of which 36 are rated by Ofsted as Outstanding. 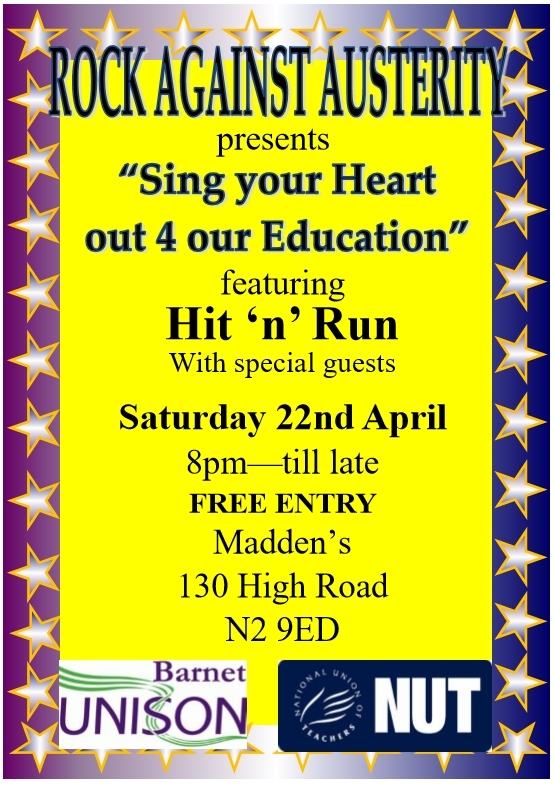 Barnet Schools must be funded for current staffing levels or excellence cannot continue. School fees are not an option for the provision of State Education and a National Education System. The Government are about to axe housing benefits for 18-21 year olds. With few exceptions, no-one under 22 will have support with housing costs from April this year. As a result, 9,000 young people will be at risk of homelessness, dues to a a cut that is expected to save only £3 million annually – a tiny amount within the Government’s overall budget. Generation Rent will be joining campaigners and organisations from across London and the UK to stand against this cut and for decent housing support for all. Please join us if you can and tell others about it – you can find out more and register below. I am writing to ask if you would support our campaign to stop the cuts to school budgets. Schools are set to lose £3 billion a year in real terms by 2020. These are the largest cuts to school funding since the 1970s. MPs from all parties have been urging the Government to invest more in our schools; in some areas governors have taken the unprecedented move of threatening strike action while parents and teachers are organising meetings up and down the country to draw attention to the issue. Our website www.schoolcuts.org.uk gives you an idea of severity of the problem. Just type in your postcode to see how schools in your area will be affected. A parents campaign has been founded and has groups in a number of towns and cities. Please sign up with them too at www.fairfundingforallschools. org. We’d like to firstly thank the Mayor of London, for opening up the much needed debate on London Estate regeneration. This consultation has given us an opportunity to highlight the iniquitous outcomes that have arisen from many estate regenerations across London, and expose the truth that numerous estate regenerations have in reality resulted in families losing their homes. (Over 300 in West Hendon alone). It was disappointing to see that the democratic voice promised by the Mayor of London in his manifesto not only disappeared from the consultation, it went on to describe such ballots as being too “complex” and binary. Does he really think that those residing on council estate are not able to grasp the arguments for estate regeneration? We have seen over the last 5-10 years developers rampaging across our great city with no consideration for existing communities and London’s great heritage. It is crucial that the Mayor gives residents in every estate facing regeneration a democratic vote without exception. This is not just a council estate issue now, the question here is “Who really does run London?”. 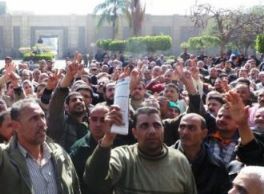 Workers at the IFFCO edible oils factory in Suez, Egypt are fighting to defend their union against employer brutality and government repression. The IFFCO workers have been fighting for an independent union for many years, and succeeded in registering the IFFCO Egypt Labour Union in 2012. Towards the end of 2016, the union formally requested a customary end-of-year salary adjustment to help offset runaway inflation. On December 26 workers were informed that money had been allocated, but the bulk of it would be distributed to management, with workers receiving little. Local management rejected the union’s request for formal negotiations to discuss distribution of the salary adjustment, prompting the union to organize a peaceful protest and declare its intention to hold a strike. On December 29, police raided the homes of the union President and General Secretary and four other workers. And on January 3, police stormed the factory and arrested 13 striking workers. On January 29 the workers were all acquitted in a Suez court of ‘inciting’ a strike, but the prosecution has appealed the decision and the workers will be tried again. Fifteen IFFCO workers including the union President and General Secretary are barred from returning to work and union members are under pressure to ‘resign’. 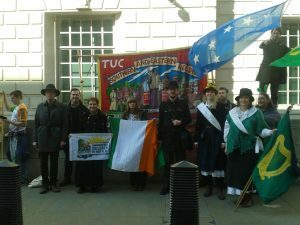 There will be a Trade Union presence on the St. Patrick’s Day Parade in London. The occasion is to remember all the Irish workers who made Britain the most industrialised nation in the world. 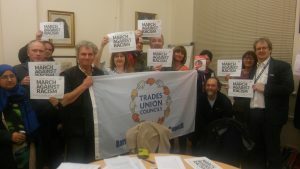 The march begins at 12 midday and we ask everybody to arrive early with their Trade Union banners if necessary. 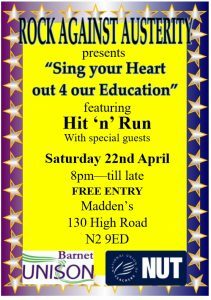 Come and help leaflet the public and get the message out. The National demonstration, March Against Racism 18 March 2017, for United Nation Anti-racism day called by Stand-up to Racism, is next Saturday. Barnet TUC calls on members and friends to meet at Argyll Street, round the corner from Oxford Circus at 11.30am. 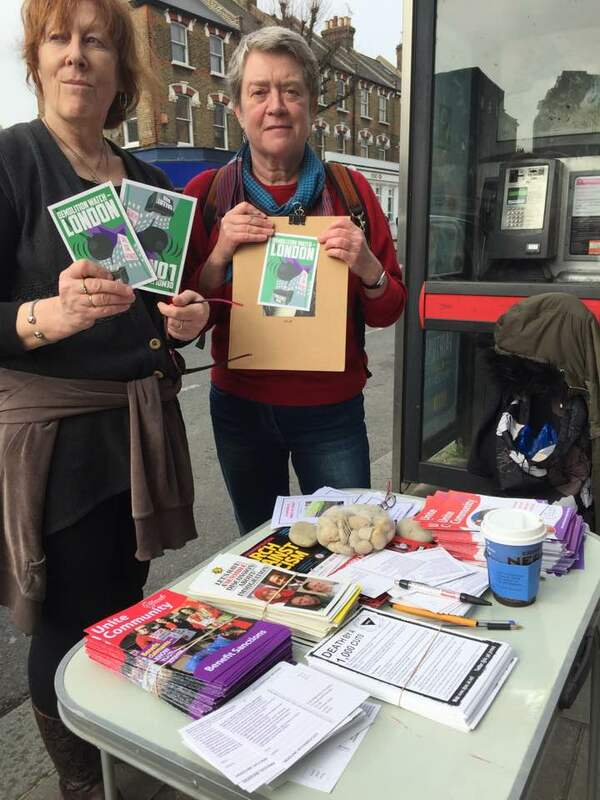 Barnet Housing action report a superb day leafletting in Fincley today, with the petition to call on Sadiq Khan to require that regeneration takes place ONLY when there is resident support. There’s still time to sign the petition before the deadline on Monday and the housing action group are taking filled out postcards to the Town Hall on Tuesday. 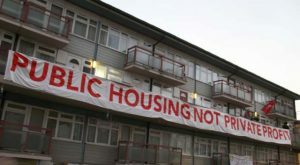 Join the demonstration outside the public inquirey on housing at the RAF Musuem, Grahame Park Way, London NW9 5LL on Tuesday the 28th of March from 11am to 2pm.